At the end of each year, we like to reflect on the Atlanta region’s real estate and economic development trends that shaped our work over the past 12 months and share our insights with our close clients and friends. 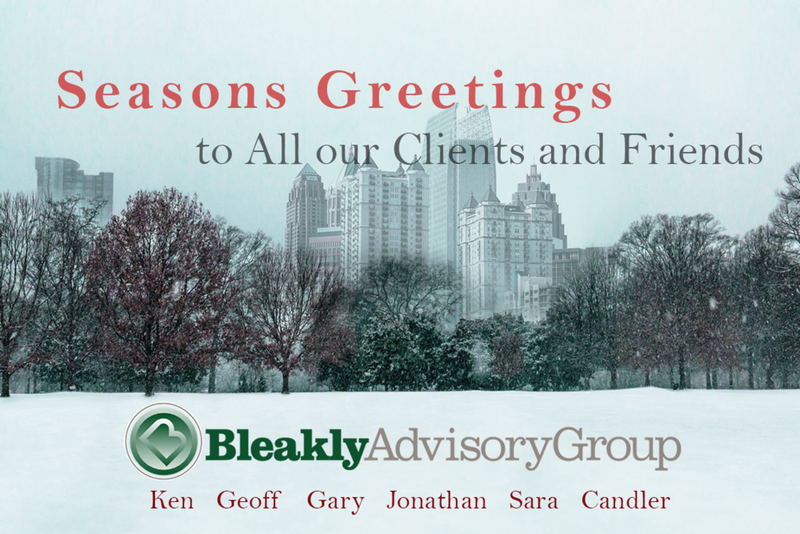 Before we dig into the trends, we would like to THANK YOU for being a friend of Bleakly Advisory Group as we move into our 17th year in business. 2017 was another great year for the metro Atlanta region. If 2018 is anything like it, the best is yet to come. The past year saw a continuation of quality growth trends in Atlanta, as the region maintains its position as one of America’s hotbeds for innovation in business, technology, and transportation, entertainment, as well as real estate development. While the region’s residents and companies continue to rediscover and strengthen the urban core, development momentum is not confined to the Atlanta city limits. Outlying areas are also in the midst of expansion and growth, as suburban downtowns and town centers across the region continue to reinvent themselves for new generations of Georgians seeking urban amenities outside of the regional urban core. Since 2010, the Atlanta region added over 550,000 residents and over 170,000 new housing units—30,000 in 2017 alone. Since 2012, a third of those new units were multifamily, reflecting the persistent demand for modern, more urban housing stock, driven by Millennials as well as downsizing Baby Boomers. The trend of mixed-use, walkable multifamily developments has not yet run its course and continues to grow. The next trend in the region, and nationally, is to find out how to make homeowners out of those Millennials with more affordable, diverse housing products. The Atlanta region’s population and household growth is driven largely by dynamic employment growth. Since 2010 we’ve added almost 700,000 new jobs -- effectively adding as many jobs in seven years as the total number of jobs in the entire Raleigh, NC region. By winning fierce economic development battles with our peers in nearby states, we fortify our position as the undisputed capital and hub city of South. To paraphrase: Atlanta still has something to say. Energetic new college graduates, as well as seasoned industry veterans, continue to set their sights on Atlanta as a land of opportunity for professional and personal growth. Increasingly, our region is the location of choice to make an impact on the world. Which makes us wonder - is anyone in Seattle taking note? 2017 saw the introduction or progression of many large, ambitious ideas that will fundamentally change the city and region. From plans for massive redevelopment in the Gulch and South Downtown, transformational vision of Summerhill at the Turner Field redevelopment, to the Battery in Cobb County, booming development along Memorial Drive, and a brand new town center in Alpharetta, growth and development continues at a staggering pace. The opening of more of the Atlanta BeltLine promises to bring about a continued improvement in the quality of life for Atlantans. It has become a model for the nation: investment goes in, magic begins. Moreover, the promise of further equitable development got a boost in 2017 with the city’s introduction of an inclusionary zoning provision along the BeltLine. With Georgia's burgeoning film industry, Midtown's internationally acclaimed tech boom, and the city's changing skyline. We're confident that the growth trends will only continue in 2018 and beyond. Bleakly Advisory Group had the privilege of working on a variety of incredibly impactful assignments in 2017. Our work for Central Atlanta Progress on the Downtown real estate market analysis was essential to the recently-approved Downtown Atlanta Master Plan, which will guide growth, investment, and development downtown for the next 15 years. Additionally, our retail market analysis for the Westside Future Fund’s Land Use Action Plan helped to get that plan ratified recently. We spent many fulfilling hours at community meetings in neighborhoods such as English Avenue and Vine City, ensuring that our work aligned with the community’s vision. Our work on Atlanta’s Westside with renowned urbanist Dhiru Thandani helped us bring home a coveted Charter Award from the Congress for the New Urbanism in May. We also worked with many developers in the private sector to find creative solutions and products to fit the region's growing demands. Nevertheless, more must be done to meet the affordability needs of the region. In 2017, Bleakly Advisory Group assisted several organizations including the Urban Land Institute, Atlanta BeltLine, Inc., and Enterprise Community Partners to turn the market towards a more inclusive, affordable Atlanta. We look forward to welcoming a new mayor, Keisha Lance-Bottoms, as she continues to make affordability a key priority and seizes the many opportunities that the city has to address this vital concern. As Atlanta changes, so too are smaller cities throughout the region changing in their own ways, often rediscovering the value of their historic downtowns and leveraging their town centers for future growth. Bleakly worked with over 20 different initiatives to redevelop these downtowns and commercial corridors into the kind of more walkable, urban places that are in high demand throughout the region. We are particularly proud of our continuing work in helping numerous Georgia cities with creating and using various economic development tools, including tax allocation districts. 2017 was without a doubt one of the busiest years in the Bleakly Advisory Group's 16-year history. Geoff Koski advanced to President, working with Ken Bleakly to continue the legacy of expertise and knowledge the firm is known for. After 10 years in Sandy Springs, we moved our office to Midtown, putting us closer to the action, and many of our colleagues and friends in the industry. Our work has often transitioned from our traditional consulting role to other development services like implementing developer agreements, which in the case of the city of Duluth resulted in around $50 million in investment. Additionally, we have expanded our market reach, with major assignments in South Carolina, North Carolina, and Tennessee. We also welcomed two new research assistants, Sara Patenaude and Candler Vinson to the team. All signs point to 2018 being another very productive year. We’re off to an early start; we are underway in developing comprehensive plans for both Gwinnett County and the City of Rome/Floyd County, as well as an exciting mixed-use market analysis for a key infill property in Greenville, SC. As the Atlanta region, and the Southeast continue to grow, we hope you have a wonderful rest of 2017 and we look forward to working with you in the new year.